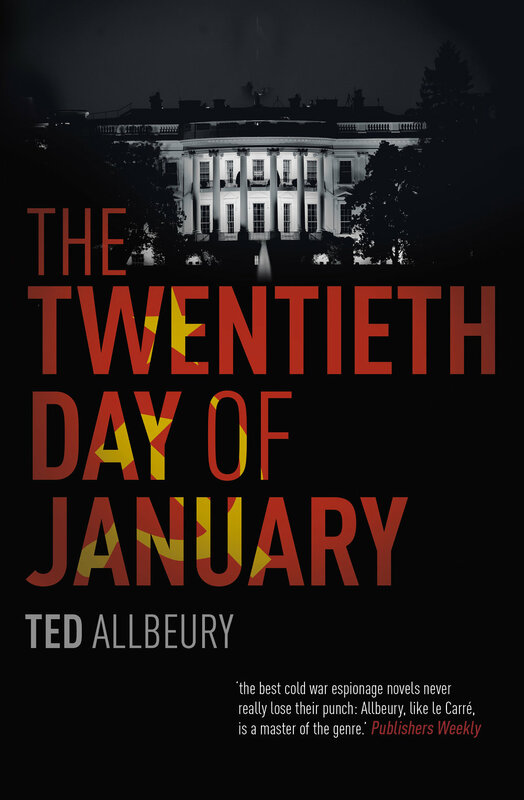 Hodder & Stoughton are publishing a new edition of Ted Allbeury’s Cold War conspiracy thriller THE TWENTIETH DAY OF JANUARY today in paperback, as well as the first unabridged audiobook of the novel. First published in 1980, the period in which the spy classic is set, THE TWENTHIETH DAY OF JANUARY explores the consequences of a presidential campaign influenced by Russian forces. Its reissue is set 'to coincide with the current political climate'. What if the Soviet Union gained control over the US Presidency? SIS agent James Mackay fears that this may already be happening when he realises the newly elected president's press secretary is a former communist radical with links to the KGB. When the witnesses who support his suspicions are systematically eliminated, MacKay must race against time to prove that the President-Elect is not his own man before Inauguration Day and avoid a national catastrophe. THE TWENTIETH DAY was re-published in the US last year by Dover Editions. Ted Allbeury was a Lieutenant-Colonel in the UK Intelligence Corps during World War II, and later an executive in marketing, advertising and radio. He began his writing career in the early 1970s and became well known for his espionage novels, but also published one general novel, THE CHOICE, and a short story collection, OTHER KINDS OF TREASON. His novels have been published in twenty-three languages, including Russian. He died in 2005. FEVER, the number one bestseller by Deon Meyer, is published today in in the USA by Grove Atlantic, hot on the heels of the Canadian publication by House of Anansi. Translated into English by K.L. Seegers, FEVER shot to the top of the South African charts after its release in English, (Hodder and Jonathan Ball, 2017), having already been No. 1 in its Afrikaans edition, KOORS (Tafelberg, 2016). The Dutch edition (A.W. Bruna, 2017) also leaped into the Top 20 in the Netherlands, where Deon was selected as the national Crime and Thriller Week’s Author and commissioned to write a special novella – DE VROUW IN DE BLAUWE MANTEL (THE WOMAN IN THE BLUE CLOAK), which features his beloved police detective Benny Griessel. THE WOMAN IN THE BLUE CLOAK, will be published later this year by NB Publishers in South Africa, and Aufbau in Germany. Deon Meyer’s work has been published in over 27 countries. In 2016, he was the second bestselling author in South Africa in any language, after J.K. Rowling. His novel THIRTEEN HOURS has just been shortlisted for the Icepick Award, to be awarded at the Iceland Noir Festival in November 2017. He also won the Deutsche Krimi Preis 2009 for BLOOD SAFARI, Le Grand Prix de Littérature Policière 2003 for DEAD BEFORE DYING and Le Prix Mystère de la Critique 2004 for DEAD AT DAYBREAK, which was adapted for an Afrikaans M-Net TV series (SA). THIRTEEN HOURS was the winner of the Barry Award in the Best Thriller category 2011 and was shortlisted for the Macavity Best Mystery Novel Award. He has been shortlisted for the CWA International Dagger three times and many of his books have been optioned for film. DEAD BEFORE DYING was filmed for a 6-part TV series, titled CAPE TOWN, featuring his character Mat Joubert. Debut thriller, I KNOW WHERE SHE IS, by S.B. Caves published today! I KNOW WHERE SHE IS, S.B. Caves' exhilarating debut thriller is published in the UK today, by Canelo, after hitting the Amazon Top 100 in its pre-publication weekend. When a young woman approaches her claiming to be the one who sent the letter, Francine wants to dismiss it as a cruel, twisted joke. But the stranger knows things that only Autumn would know. It soon becomes clear that Francine must go to dark places in order to learn the truth about her child’s kidnapping. She will discover that danger comes from unexpected sources. She will do things she never imagined herself capable of. I KNOW WHERE SHE IS is published today in the UK, by Canelo, reaching the Amazon Top 100 in its pre-publication weekend. It will be published in Germany by HarperCollins and in Sweden, by Modernista in 2018. Born and raised in North London, S.B. Caves is a screenwriter and boxing fanatic. He is currently writing his second novel, a thriller based in London. Find out more about the author on Blake Friedmann’s website.